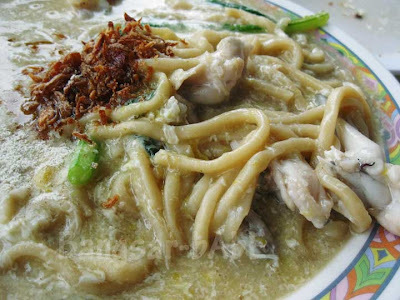 Bangsar-bAbE: Shum shum, I’m taking you and rif for lunch this Saturday. So meet me at my place and we can go from there, ok? Shum: Where are we going? Bangsar-bAbE: Not telling you. Just wear casual clothes and try not to wear long pants or a long sleeve shirt. And bring your appetite! Come Saturday, the three of us got into rif’s car and headed towards Batu Caves. 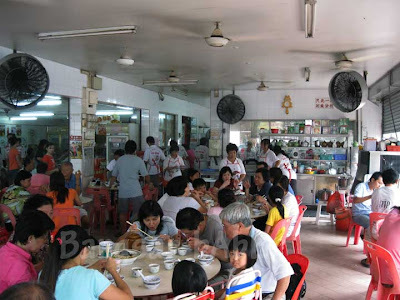 Within 30 minutes, we were at Pan Heong, a restaurant famous for its Sang Har Hor Fun and porridge. At 12.15pm, the place was packed with many people (us included) waiting for a table. 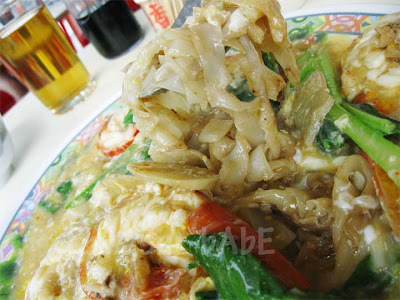 I ordered the Sang Har Hor Fun, which was essentially a dish of fresh water prawns over flat rice noodles in thick gravy. This is highly recommended by rif (this fella really pandai makan!) 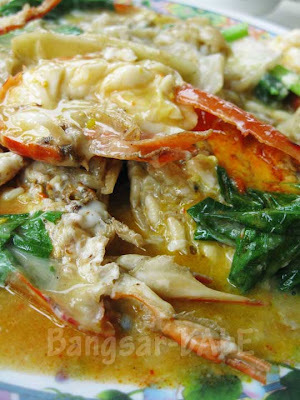 because according to him, the natural sweetness of the prawns brings out the flavour of the gravy. You need to order a minimum of two prawns and you can choose between hor fun or loh shi fun (rats tail noodles). Our noodles (RM36) came with two medium-sized prawns (halved) with their heads full of bright orange roe. Just the sight of it immediately made my mouth water. The orange-ish gravy was full of prawn-y goodness and it was rich with roe. The fatty pork was full of flavour and almost melts in the mouth. 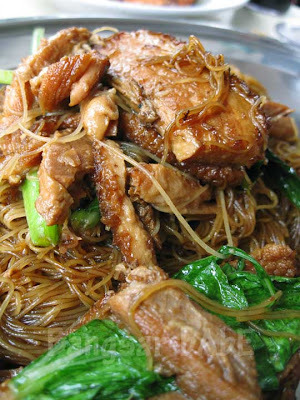 Each strand of the springy mee hoon was well coated with stewed pork oil and gravy. It also had a distinct wok hei, and I enjoyed this tremendously! I saw a few tables having a plate of nam yue pork (RM11.50) so I followed suit. Nam yue is a red fermented beancurd that is very salty with a distinctive flavour and a hint of rice wine. 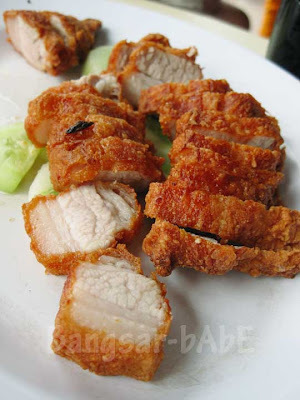 The pork had a light and crispy exterior, while the inside was tender with just the right ratio of meat and fat. It is best eaten hot as the meat becomes slightly harder once it turns cold. 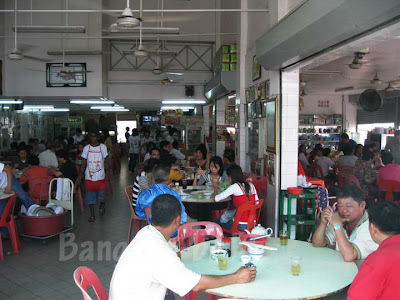 Halfway through our food, we got greedy and ordered the loh mee with frog legs for 2 people (RM15.50). 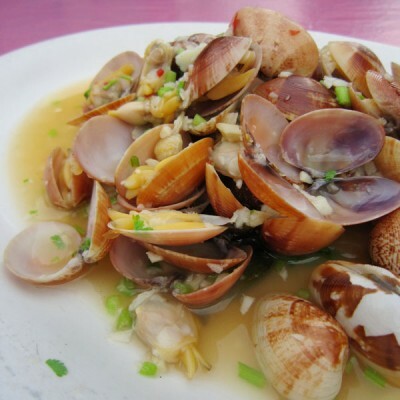 Topped with fragrant fried shallots, the thick and flavourful gravy was further heightened with a dash of vinegar. 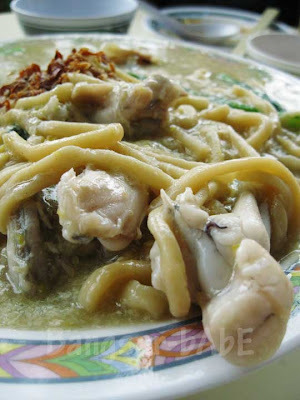 I reckon the gravy is similar to the one used in the sang har hor fun, but the frog legs gave it a different twist. This tasted lighter and less rich compared to the former. I didn’t care much for frog legs but it was smooth and tender. 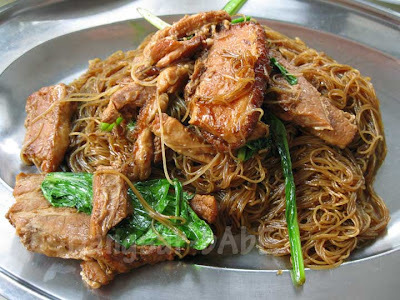 While the loh mee was decent, it failed to outdo the sang har noodles and kau yuk mai fun. We couldn’t finish the mee as we were very full, so we tapau-ed the balance home. All the above came up to RM81.30 inclusive of 2 cups of herbal tea and one Chinese tea. Pretty reasonable don’t you think? It’s quite difficult to find parking…so exercise some patience and be prepared to walk! Verdict: Possibly the best Sang Har noodles I’ve had, and the kau yuk mai fun is a must order! Luv how u desc the food here! almost made me abandon office & drive over NOW! Noooooo!! I want one of EACH!! All to myself! And I've just started a diet today, after all that holiday indulgence! I'm doomed! i've only recently become a big fan of sang har meen, but i've never tried this flat noodles version before. better than the crispy noodles version? vinlee – Got pineapple tarts?? I didn't know if…or else I sure buy! leo – It's not THAT hot…got a lot of misting fan. Never try never know! yummy yummy yummy love it. U guys really know how to dig good food lol. 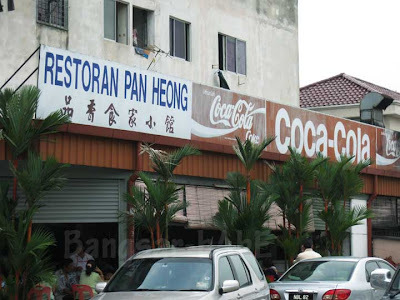 Another place to add into my list of good food that need to be try . 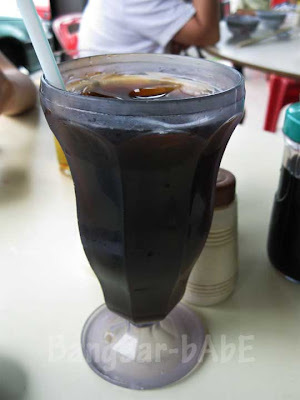 mimi – I think it's the can one kua…if not then how come so flavourful and shiok? Ya…have to wait, or go before 12 lor! Not sure where exactly this restaurant is located in. 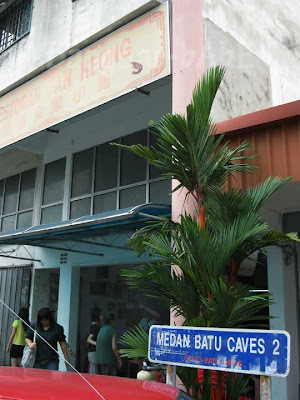 Anything to do with Batu Caves? Looks good, would love to check them out! aiks..again read your blog at the wrong time, lunch time now, but cant drive that far..
Gosh! 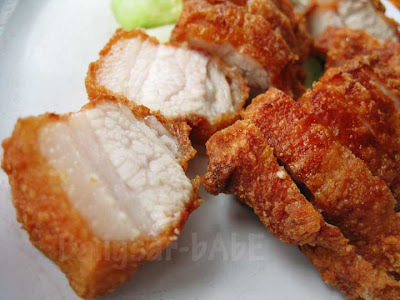 nice and clean photo, really drooled for the deep fried pork! vixar – Hehehe…it WAS drool-worthy! taufulou – Tomorrow's Friday…can take long lunch, no? 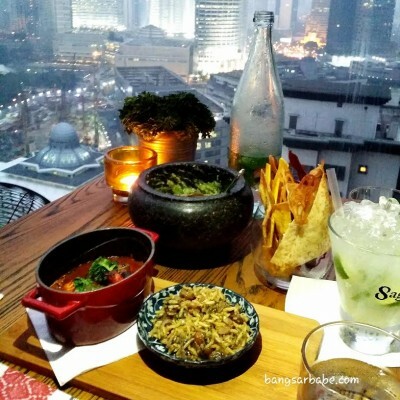 speaking of pork, i was wondering that have you ever tried out a place called El Cerdo at Changkat Bukit Bintang?? I just came back from KL and had paid them a visit. To be frank, i never had such delicious pork in my life, that was a great pork-culinary-journey!!! Kinsoon? Never heard of this place before…will try looking for it when I happen to be around that area! My Taste Heaven said – Nope…I haven't tried El Cerdo, I frequent Deutsches Haus across the road instead. I told u the Pineapple Tart In KL is No 1 I never take the Pineapple Tart Like this Original Tast and the Pineapple Jam is Great Next Time U go Pan Heong Remember Buy a pack to try it 1st sure u love it. After Tast let me know ok. It doesnt open at night! what a shame!